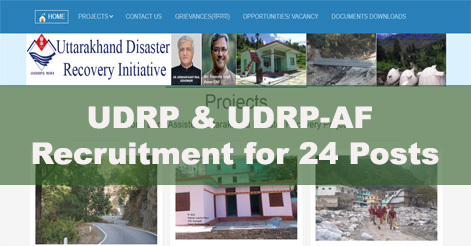 Uttarakhand Disaster Recovery Project (UDRP) & UDRP-Additional Financing (UDRP-AF) has released the advertisement for the recruitment of Deputy Program Manager, Expert Office Management, Environment Officer, Assistant Engineer, Junior Engineer, Data Entry Operator, and Stenographer & Multi-Purpose Worker. Total no. of post is 24. Applications are invited for the following assignments latest by 26/07/2018 for engagement of services under PMU/PIUs. (ii) For post no. 4, 5 & 6 candidates who have already applied in October 2017 need not apply again; their application shall be considered on the basis of their previous application. The envelope should be super scribed with the assignment applied for and the Job Code. All the eligible candidates are shortlisted on the basis of their application form. Only Short-listed candidates will be called for interview. Help us to improve this article/job posting "24 Vacancies in Uttarakhand Disaster Recovery Project (UDRP),Dehradun". We would be glad if you can comment below and provide your valuable suggestions and feedback. If this page have any wrong information/list or out of context content, then you can report us as well. TYPING KA RESULT KAB AAYGA? btado typing ka result mail par aayga ya site par. Please confirm the typing test result of uttrakhand disaster recovery project. please mail us. result aayga bhi yanhii…fraud vacancy thi kya ye……?